The United States of America, of which I am a proud citizen and tax payer, wants a cease fire in the Middle East. They want the fighting to stop between Israel and the Hamas/Arabs in Gaza. I do not want a ceasefire, I want peace. The American president is urging "Restraint", a Mr. Kerry is "upset by the footage of women and children being hurt by this conflict". C'mon Virgins, stop the lies and hypocrisy. You know better than that. You are simply embarrassing yourselves. The USA is concerned that "innocent civilians are being hurt" in this conflict. Allow me to review a few facts. 1. This is a war of self defense and preservation. If we lay down our arms there will be massacres as there were in the past. Auschwitz and Treblinka would be fully rebuilt and expanded. 2. The Arab leadership supported Hitler and the Nazis, We have the photos and the videos. Do not even bother trying to argue, you have no chance. Do not embarrass yourself by your lack of knowledge. The Arabs raised an entire brigade to fight as part of the Wehrmacht. 3. The Israeli Defense Forces (IDF) is the most moral army that ever existed. We have the the proof and there is no need to dispute this. We drop millions of leaflets to warn Arabs of an impending attack so they have time to evacuate a war zone. We make hundreds of thousands of phone calls to warn citizens. A. If the Israelis see them and more often than not, will chose not to hit the target, the Arabs win. B. If the Israelis do attack there will be dead Arabs, which is great for the Public Relations campaign. It is a win-win situation. 5. The Hamas terrorists hide their weapons and fighters under religious and educational institutions as well as hospitals. If the IDF hits these the Arabs shout "Genocide, War Crimes". They are the ONLY ones committing war crimes over here. How dare they make that accusation against us when they support the greatest war crimes of all time; the Holocaust. I have seen the footage, Israeli air force approaches a known target where terrorists and weapons are kept. But somehow just at that moment there are children on the roof playing games...and the fighter jets turn away. No, we do not target civilians, but in urban warfare, it is inevitable that civilians will be killed. When you ask Israeli soldiers and pilots if we are fighting with our full capacity, the answer is a resounding NO. We are fighting with one hand tied behind our back, and the other 3/4 tied. Mr. President, we ARE using restraint. Now...lets take a little walk down memory lane. Shall we? The operation bombed downtown Tokyo. Now correct me if I am wrong, but I think not everyone in Tokyo was a soldier, I think there was a pretty decent chance that "some civilians" may have been killed. Did any Americans demand a ceasefire then? If not, then why impose one on Israel Mr. Kerry? Was the survival of the USA at stake? The goal was described as "retaliation", and the results "No significant military effect". 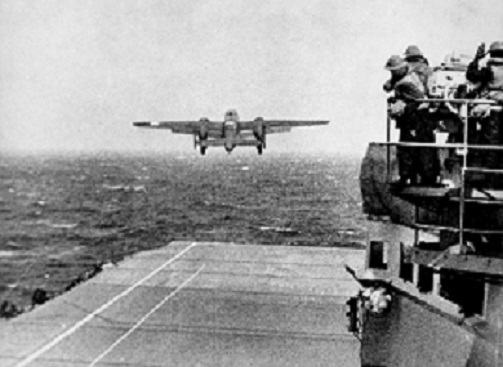 "The raid caused negligible material damage to Japan, only hitting non-military targets or missing completely but it succeeded in its goal of raising American morale". Lesson: It is OK to target enemy civilians as long as it is "Revenge" and it boosts our morale. Lets please keep that in mind. Raid on Tokyo, to boost morale. Lets not worry about civilian causalities. Hiroshima, Nakaski - Hmm....how many causalities? According to the internet it was 200,000. The effects continue to this very day with genetic and other damage. For years no one from outside these areas would be willing to marry someone from the atomic area for fear of genetic mutations. Is it possible that some of these Japanese were non-combatants? Were these areas firing rockets over New York and Washington? Why not simply send in an Israeli and negotiate a ceasefire? Oh right, the Jews were busy being gassed at Auschwitz and Treblinka and shot in the forests of Poland, Russia and Belarus. Now please understand, this is NOT a condemnation of American and Allied military actions. I support them 100%. But please be fair to Israel and do not be a hypocrite. I will not even address the internment in concentration camps of loyal Japanese-Americans during the war while other Japanese-Americans were fighting and dying for America. 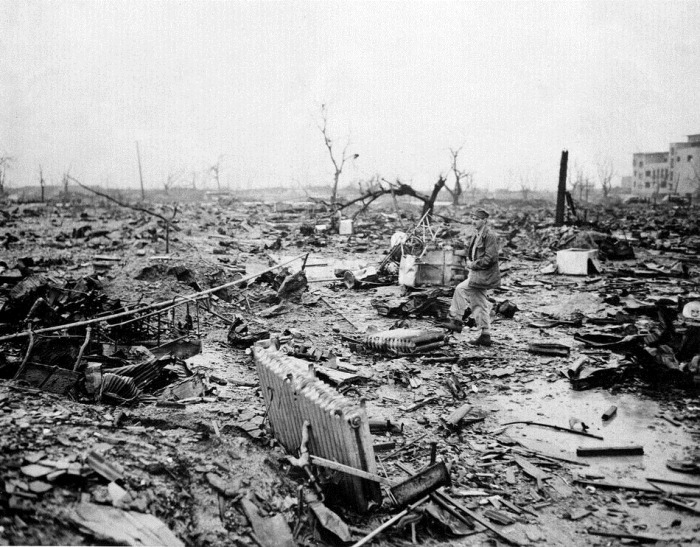 Hiroshima after being bombed, I wonder if any civilians were around? Berlin - During the last period of World War Two when it was clear that Germany was defeated the Allies bombed Berlin night and day. I believe the official statistics are 410,000 dead German civilians. The goal was to crush the spirit of the German people, not to protect New York and London from rockets. Now, let us for a moment imagine the following situation: Some Jewish guy comes along and pressures the USA to accept a ceasefire with Nazi Germany after the USA has sufficiently "weakened the Nazi party". Now every two years the Nazis attack again, the USA responds and again the USA is forced into a ceasefire. We now know that Nazi Germany was busy developing very advanced weapons the kind of which the world had never seen. They just needed a little time. A ceasefire is exactly what they needed to prepare these weapons. Each time the USA would come back they would have to face a fiercer and better prepared army. Each time more American boys would die, but the job would never be completed, the enemy would always survive. Sounds like a bad version of the movie "Ground Hog Day", the past is relived daily. Or we are just watching reruns. 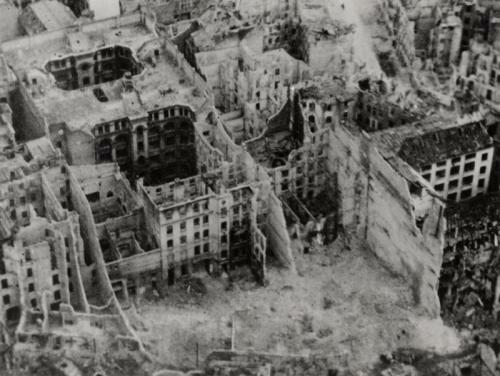 Berlin after being bombed by the Allies, necessary to win the war? Vietnam - Wow! Lets not even go there. Lets not even raise the question of entire villages being wiped out. Lets not talk about the betrayal of an American ally as the American troops ran away. Lets not talk about how Asian lives were regarded. I am a proud American citizen and I believe the USA takes the measures it must take to protect itself, but I am also a proud Israeli. Shouldn't the same standard be applied? 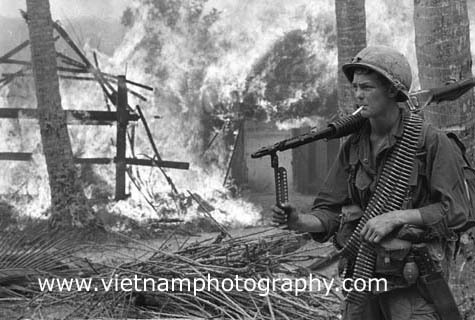 US soldier in Vietnam, entire villages destroyed. I support the United States, I registered for the draft when I was younger. In World War Two my grandfather and many male relatives fought. My cousin Willie was killed in the Battle of the Bulge. Let no one doubt my support for the United States Military. But do not, do not point a finger at Israel. You have NO right. What we want is not a ceasefire, we want what America demanded of Germany in World War Two. We want unconditional surrender. We want our enemies to no longer present a threat to us. We want them tried for war crimes. We want Truth and Justice to prevail. What side will you be on this time?? America just issued a travel warning against us. There is no reason for this, but just to be on the safe side, please keep Mr. Kerry at home.